We anchored off the coast of Komodo Island early this morning. The entrance to the harbor is pretty spectacular. Jagged peaks and lush green surrounding beautiful, calm, blue water. Because we made such good time getting here last night, all the tours started a half hour early. Ray stayed on the ship today because he didn't think he could manage gettting on and off the tender. The tender ride to the dock was short this time, maybe only 5-10 minutes. 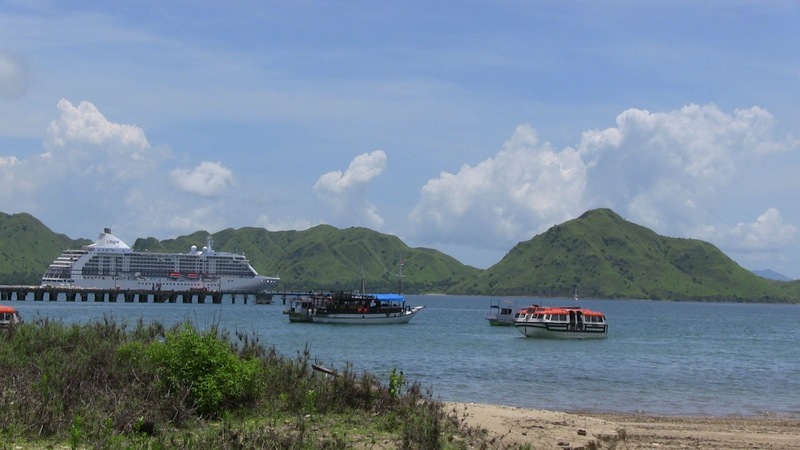 There was only one tour available, and hour long nature walk through the Komodo National Park. 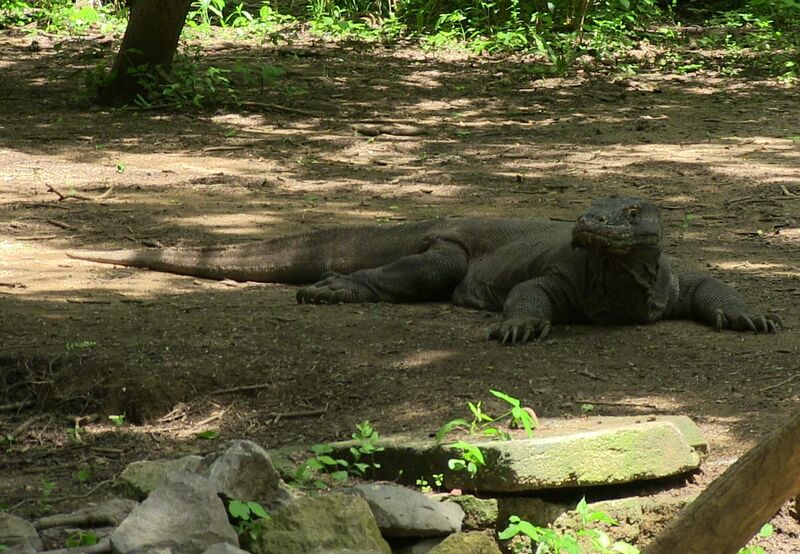 There were 25 groups, each consisting of about 20 tourists, a park ranger guide, and 2 other park rangers with special forked sticks to fend off Komodo Dragons in the event any of the decided to attack. Once my group was all together, we began the hike into the forest. The guide stopped occasionally as we walked to tell us about the plants and trees along the way. We walked the path for about a half hour without seeing any animals and I was beginning to think that was it. Then we came to a sign asking everyone to keep quite. Just beyond the sign was a watering hole and there were 4 Komodo Dragons lounging around the clearing. There was nothing between us and the dragons. We circled around them taking pictures. One of them started to walk towards us and the people in front of him slowly moved to the side. Our guide said they only eat about once a month, but the rangers with the sticks were standing ready. There are supposedly lots of other animals in the forest. The Komodo dragon will eat just about anything. We saw a couple of deer in the distance as we walked through the forest. 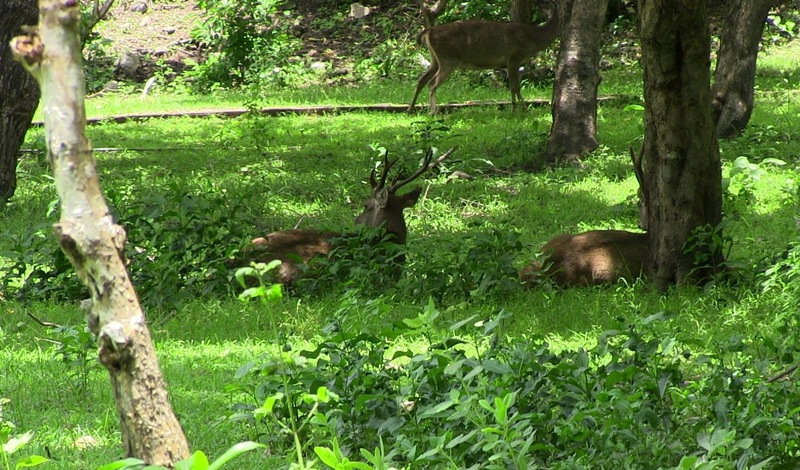 Near the end of the trail we spotted a group of deer resting in the shade. Of course, at the end of the trail, the locals had a market set up to sell carvings, t-shirts, and batiks. I bought a couple of mementos before getting in line to get a ride back to the ship. It was really hot and humid out there. My clothing was soaked by the time I got back to the ship. The first order of business was definitely a shower. We then went out on the balcony to watch our sail away. There were kids in small boats all around the ship begging people to throw them some money, and they stayed right up until the ships engines were started. In previous posts I have talked about the problems that have plagued this portion of our journey. Although the cyclone delay and the singer's death that kept us an extra day in Darwin were events out of the cruise company's control, their management has decided to give everyone on board a credit off a future cruise amounting to 50% of the price of the Sidney to Singapore segment of this cruise. I think that is very generous. We are already thinking about how we can use that next year.